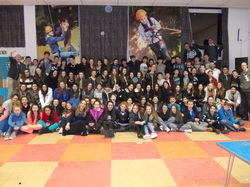 A record number of pupils enjoyed a fantastic weekend away on the year 9 Shabbaton over the 10th-12th of January. The Kingswood Centre , Sheffield, was the setting for 83 King David pupils and students from King David Liverpool, who returned from the experience declaring that, ‘it was one of the best weekends ever’. After a coach ride, which set the tone for the weekend,the children were welcomed to the centre and given time to prepare for Shabbat. A number of the staff remarked on how smart and well-presented the pupils looked, showing that they clearly respected the need for dignity as well as celebration. 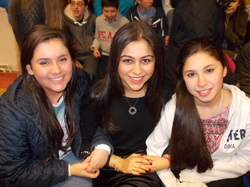 Friday Night Dinner was a great success, with the very gifted Stuart Bernstein delighting over a hundred students and staff with a delicious four course meal and inspiring speeches from Rabbi Ross , Rabbi Pereira and Rabbi Silverstone left everybody reflecting on the need to show kindness and compassion as part of their daily lives. Spirits were high as everyone looked forward to the following day yet the King David staff were pleased at the prompt responses to their requests for the students to head to bed and get some sleep. Shabbat morning began with a breakfast Kiddush and there was also a popular optional Shabbat service led by Rabbi Cohen. The Aish team then took over and conducted a variety of fun-filled activities, culminating in a rather amusing competition involving fancy dress and performance theatre, drawing cheers and laughter from the enthusiastic audience. At the heart of the hilarity, was the message that we need to be grateful for the lives we are able to lead – a message that each and every pupil seemed to appreciate. Teamwork was used effectively in Aish’s post-lunch activity: a crime solving project that relied on the dramatic talents of KD’s own Rabbi Cohen and the multi-talented Aish leader and ex-student Benji Harris to help reveal the mystery. A number of students stated that this was one of their favourite parts of the weekend. Chef Stuart’s Third Meal was another roaring success – the cholent being a particular favourite which was followed by an inspirational Havdallah service held under the stars. The final activities of the trip included an opportunity for each pupil to create their own ‘graffiti board’, subject themselves to sitting for a caricaturist, and create their own ice-cream concoction. The final treat arrived later in the evening in the form of Rabbi Goodman and a mountain of pizzas and chips which were devoured by the children and staff alike, all of whom still had enough energy left to dance the evening away. Once the curtain dividers were removed and the disco tunes came to an end, the sleepy students turned into a captivated crowd as Zak Frieze on guitar and Dalia Kay treated their audience to some beautifully performed acoustic songs. Minimum fuss was made when bed time was eventually called and it was fair to say everyone had earned a well-deserved sleep. What set this Shabbaton apart, was the incredible selflessness and generosity displayed by a number of students : agreeing to swap rooms in order to make others happy; looking out for the less-confident pupils; following instructions so quickly and politely. As well as showing off the qualities that would be expected from KD pupils, the way in which this year group impressed with their maturity and kindness means that the expectations for a successful Israel trip in May, have never been higher. Simply learning, from the centre manager, that she had ‘never seen the rooms left in such an excellent condition’ was further proof that this is a special group, one that has been a credit to their school and deserving of high praise. A big Thank you to all the Aish Team led by Rabbi Ross and Mord Maman and Mrs. Shiffy Silverstone together with all the wonderful King David staff.